In Mike Barnes’ biography of Don Van Vliet, the man more famously known as Captain Beefheart, he quotes Vliet on his own birth: “I was born with my eyes open—I didn’t WANT to be born—I can remember deep down in my head that I fought against my mother bringing me into the world,” he says about that day in 1941 when Vliet became a real, living person, despite his best in-womb intentions. 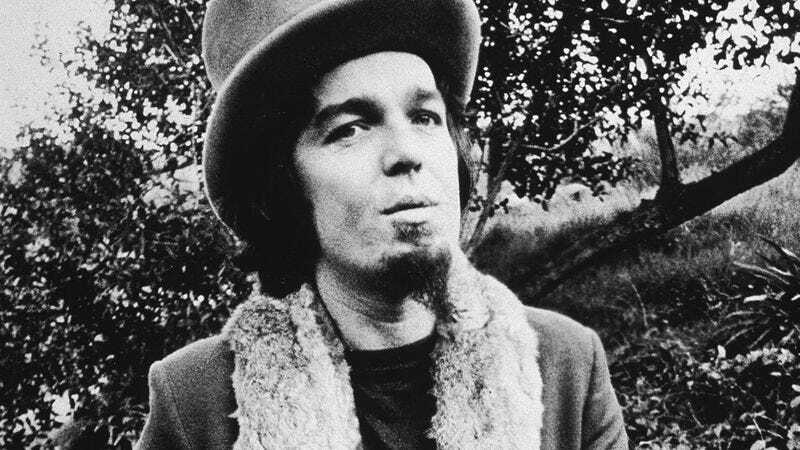 “I remember when the jerk slapped me on the fanny and I saw the yellow tile and I thought what a hell of a way to wake somebody up.” This anecdote, with its hilarious absurdity and sense of mythmaking, is only part of what makes Captain Beefheart such an intriguing and monumental figure in the history of rock music. After all, persona is only part of the rock god equation. As Captain Beefheart, Vliet found the perfect mask for his creative visions, one that would both adapt to and push the boundaries of genre throughout the ’60s, ’70s, and ’80s. Captain Beefheart’s discography isn’t intimidating in its size; what can be intimidating is how his music engages with a plethora of genre signifiers that can sometimes be impenetrable, or at least confusing to someone unfamiliar with his work. Jumping into his ambitious, chaotic, avant-garde masterpiece Trout Mask Replica isn’t advised, even if it is, arguably, the best album he ever created. In fact, Beefheart’s discography can be explored most rewardingly in chronological order. His earliest recordings might be the most accessible, and certainly provide the easiest entry point into his music while also hinting at some of the sonic and lyrical idiosyncrasies that he’d explore throughout his career. Captain Beefheart and his Magic Band, as was the name of Vliet’s outfit when they signed to A&M in 1965, found initial, mild success with a cover of Bo Diddley’s “Diddy Wah Diddy,” the song becoming a local radio hit in Los Angeles. It was an appropriate first single, as blues and R&B were the main influences that Beefheart drew on for his first two studio albums, 1967’s Safe As Milk and 1968’s Strictly Personal. No need to mince words here: Safe As Milk is a blues-tinged garage rock classic, at turns soulful, off-kilter, and heavy. There are few better road tunes than “Zig Zag Wanderer.” “Dropout Boogie” is so fuzzy and so straightforward, until it’s not, when it shifts gears and delivers a beautiful piano-laden bridge. “Abba Zaba” is also a highlight, hinting at the strange rhythms and lyricism that Beefheart would employ on his later releases. More than just an early indication of Beefheart’s ability to blend the melodic with the offbeat, Safe As Milk boasts some of the Magic Band’s best arrangements, due in large part to the guitar work of a 20-year-old Ry Cooder and the inventive drumming of longtime band member John French. This was psych-rock before it shifted into prog-rock territory; laser-focused, certainly out there, but always with a melodic core. Strictly Personal, released just a year later, is a bit stranger, and the release was mired in controversy. Much of the album was meant to be a project called It Comes To You In A Plain Brown Wrapper, a double-disc release that never properly saw the light of day. The album was recorded in 1967, but when the tracks were handed over to Buddah Records, who had released Safe As Milk, Buddah was hesitant to release it. Instead, producer Bob Krasnow stepped in and released it on his own label, Blue Thumb, the following year. That wasn’t the end of the controversy though. Beefheart alleges that many of the album’s overt audio tricks—including cheesy psych-rock effects like distracting phasing and a beating heart—were the result of Krasnow adding them to the mix after recording, done without Beefheart’s knowledge. It’s true that Strictly Personal does contain some obnoxious, clichéd sonic moments, but at the heart of this release is the same tight songwriting and idiosyncratic arrangements that made Safe As Milk such a classic. Album opener “Ah Feel Like Ahcid” embodies the heart and soul of blues music, shuffling along, largely a cappella and adorned with handclaps. Then there’s “Beatle Bones ‘N’ Smokin’ Stones,” where Beefheart inflects his voice with disdain as he lampoons “Strawberry Fields Forever.” On this track, the audio phasing actually works to satirize Sgt. Pepper-era Beatles arrangements. It was early in his career, but Beefheart was already deconstructing and reconfiguring psych-rock signifiers, bending and shaping them to fit a creative vision that would be cemented on his next record. In 1969, Beefheart and his band released the monumental Trout Mask Replica, an album of avant-garde blues, psych-rock, and jazz that would push rock music further down the rabbit hole, paving the way for more experimental prog acts like the Peter Gabriel-fronted Genesis. Trout Mask Replica isn’t an easy listen. It’s 80 minutes of weird, punishing, beautiful music, complete with woodwind solos and spoken word pieces. There are gorgeous melodies and infectious sonic layers, but there are also unstructured moments, abstract imagery, and unwieldy time signatures. It’s a brilliant album, the type of record that, when first encountered, can be off-putting, but pushes us to understand genre, music, and art in different ways. John French is a revelation on this release, his frenetic but controlled percussion matching Vliet’s whacked-out psychedelic vision at every turn. Vliet also turned to his old friend Frank Zappa for production duties, and the result is a mix that manages to make sense of the chaos while remaining challenging and disorienting. There are moments that blend free jazz with garage rock, as on album opener “Frownland,” or the gloriously unhinged “Dachau Blues.” There are moments of pure improvisation, as on “Hair Pie: Bake 1,” when guitars clash against flailing saxophones. Beefheart growls his way through each arrangement, spouting surreal imagery alongside the chaotic sonic flourishes. “Well” is a beautiful piece of spoken word, Beefheart’s cadence like that heard on an ancient sea shanty. “Ant Man Bee” is a soulful boogie, one of the album’s more straightforward moments, the perfect counterbalance to free-flowing songs like “The Blimp (Mousetrapreplica)” and “Pena.” Trout Mask Replica re-imagined what rock music was capable of, managing to remain in touch with rock’s roots in blues while crafting a vision of the genre’s future. The momentum created by Trout Mask Replica didn’t let up with the release of the band’s 1970 album Lick My Decals Off, Baby. Sonically similar, but perhaps more assured in its aesthetic, it’s essentially an extension of Trout Mask Replica, a spiritual companion recording that should be consumed alongside the 1969 masterpiece. The sonic experiments are still in tact here, but they’re refined; there’s a predominant sense of structure and genre playfulness, and it contains some of Beefheart’s best individual songs. There’s the wandering, gorgeous instrumental track “One Red Rose That I Mean,” and the off-kilter title track, and the driving “Bellerin’ Plain.” Beefheart and company had tightened up the instrumentation and songwriting, and the result was a clearer creative vision, more accessible and more confident. Around the same time, the other half of that Brown Wrapper double-disc that never happened would be repurposed as Mirror Man, a largely wordless record that runs close to an hour in length despite being composed of just four tracks. The album falls in line with releases from prog bands like Genesis and Yes, who, at the same time, were pushing track lengths into the double digits, crafting intricate arrangements filled with complex instrumentation and various time changes. Mirror Man isn’t so much a prog-rock record as it is a collection of extended blues jams. There are hints of Beefheart’s experimental side, but the ultimate result is tedious. The arrangements fail to build any tension, an often-necessary part of any lengthy jam, and never feel like more than tossed-off curiosities. After Mirror Man, Beefheart’s discography becomes much more accessible, more in touch with the blues of his earliest recordings. Depending on how you feel about Trout Mask Replica or Lick My Decals Off, Baby, albums like the 1972 releases The Spotlight Kid and Clear Spot, or the 1974 debacle that is Unconditionally Guaranteed, will either prove to be palatable blues-rock records or a sudden dismissal of everything that made Beefheart such a powerful and compelling musical force. Clear Spot is at once charming and witty, though the arrangements are wanting. This is rote blues boogie music, perfectly serviceable but lacking the energy of previous Beefheart releases. Still, there are some revelatory moments. “Nowadays a Woman’s Gotta Hit a Man” is particularly sly, and “Big Eyed Beans From Venus” features some great slide-guitar work courtesy of Bill Harkleroad, credited on the album as Zoot Horn Rollo. It’s one of Beefheart and his Magic Band’s heaviest moment. The Spotlight Kid is even more blues-influenced and straightforward than Clear Spot; it’s also the most languid of releases in Beefheart’s discography. Again, the songs here are perfectly serviceable—blues arrangements that never make much of a fuss sonically and never challenge the listener—but compared to the relative vitality that permeated Clear Spot, The Spotlight Kid is tepid by comparison. This is Beefheart coasting, or perhaps looking to appeal to a larger audience. It’s no secret that his more experimental albums didn’t bring commercial success for the band, and it’s hard not to see this album, and its follow-up, Unconditionally Guaranteed, as soulless pandering. Beefheart’s other 1974 release, Bluejeans & Moonbeams, benefits from the lackluster force of its predecessor. By no means a hit among his discography, there are still a few pleasant surprises, including lead track “Party Of Special Things To Do,” a swampy, grungy track that sees Beefheart recapturing some of that gruff, kinetic vocal energy that elevated the mediocre arrangements on Clear Spot. In the mid ’70s, Beefheart was collaborating with Zappa quite a bit. The best of his appearances, alongside some harmonica features on albums such as Zoot Allures, is an intriguing album of live and studio recordings called Bongo Fury. Included are a few performances from Beefheart’s tour with Zappa and his band, and they convey the creative bond shared by these two performers. It’s a wonderful document of friendship and artistry, as well as an insight into how both Zappa and Beefheart were continuing to push the boundaries of their music in a live setting. After the commercial and critical failures of Unconditionally Guaranteed and Bluejeans & Moonbeams, Beefheart had a comeback of sorts, the type of career rejuvenation music critics in 2014 would quickly label a “return to form.” Beefheart went to work on recording an album titled Bat Chain Puller with the help of Zappa, set to be released on DiscReet, a label co-founded by Zappa and his manager Herb Cohen. But after Cohen allegedly funded the Bat Chain Puller sessions with Zappa’s royalty checks, Zappa was furious and withheld the master recordings. Beefheart thus had to regroup and record a new album, resulting in Shiny Beast (Bat Chain Puller), a pitch-perfect blend of everything Beefheart had done so well before. It’s melodic, infused with gritty garage rock details, and contains some of the finest spoken word pieces Vliet ever put to record. The clean production was also a revelation. Whereas such production gloss only highlighted the tepid arrangements on The Spotlight Kid, here it shined a light on Beefheart’s ear for pop music, finding a melodic through-line amid percussive and vocal commotion. Bat Chain Puller would eventually be released in 2012, essentially comprising the original recordings of songs that would appear on Shiny Beast (Bat Chain Puller), Doc At The Radar Station, and Ice Cream For Crow. While Ice Cream For Crow, Beefheart’s final release, is a compelling study in nostalgia, an ode to psych-rock at a time when electronic music was invading the space of rock, Doc At The Radar Station is Beefheart’s late-career triumph, a reworking of older material that feels fresh and truly reinvigorated. Beefheart jumps back and forth between the full-blown garage rockers he executed when he was younger, and beautiful, soulful pieces. There’s energy and dirty imagery in “Ashtray Heart,” frenzied creativity in “Brickbats,” and a sad beauty to instrumental track “A Carrot Is As Close As A Rabbit Gets To A Diamond.” This is the finest of late-stage Beefheart, an album that engages with the history of rock, the mythology of Captain Beefheart, and the continuing narrative of rock music as it moves into the ’80s. Vliet retired from music after the release of Ice Cream For Crow in 1982, instead turning his creative energy to painting; in fact, that final album features one of his paintings on the front cover. To this day, Beefheart’s musical influence can be felt, especially with the rise of California garage rock in the past few years, practiced by artists such as Thee Oh Sees and Ty Segall. On November 11, Rhino will release a box set titled Sun Zoom Spark: 1970 To 1972, which will include reissues of Lick My Decals Off, Baby, The Spotlight Kid, and Clear Spot, along with 14 previously unreleased outtakes. Those three albums may not be the most prominent on the “best of all time” lists that go around every few years, where Trout Mask Replica typically dominates, but they’re monumental in their own right. The Spotlight Kid and Clear Spot in particular are primed for critical revaluation, and also present new listeners with an accessible, but still invigorating, entryway into the weird world of Captain Beefheart.